Do you need a Sabbatical, find the REAL YOU, WWOOFing. WWOOFing fits the Budget! One of the most important aspects of any trip is to set and maintain a budget, at $70.00 for a 12 month membership you’re covered! When you WWOOF, the basic agreement is you work 4-6 hours a day, maximum 38 hours in a week and learn about an industry of your choice from our large number of varied Hosts. 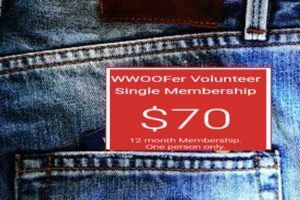 Use this WWOOFing time to find out what it is in life that you really want to achieve, live to your full potential and build your own network of friends around Australia that will change your life forever. Have a backup plan ready, after your 2nd Year Visa has been signed off! For as little as .20 cents per day you have the comfort of travelling around Australia, knowing where you will be sleeping and eating clean, healthy Organic food, harvested by yourself at the end of each day, sharing wonderful stories with like-minded individuals that are willing to open their homes and family to you whilst you are here visiting our wonderful country.